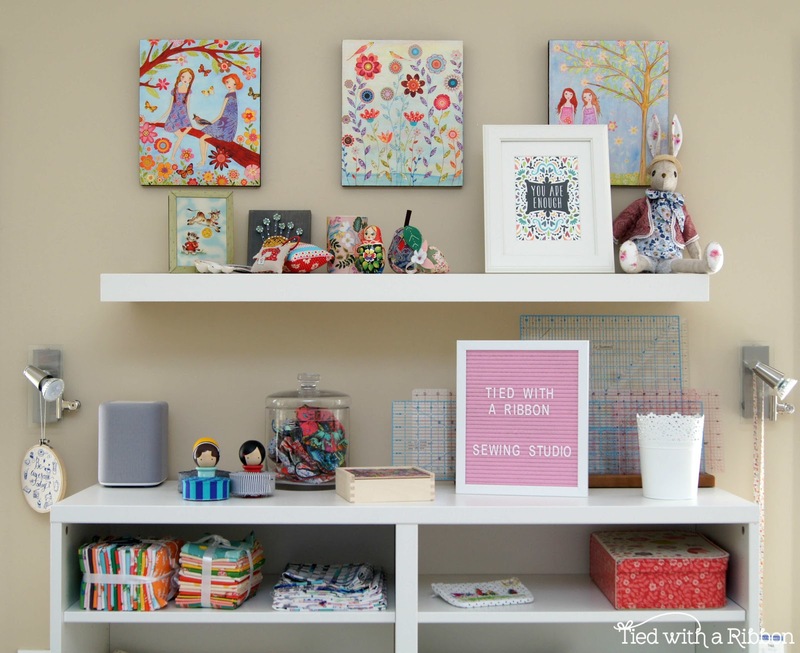 Tied with a Ribbon: Sewing Room Makeover! Well 2018 is getting off to a wonderful start here at Tied with a Ribbon Head Quarters! Over the Christmas break my sewing studio has undergone a re-vamp. This room in my house was originally our Guest Room so is a little larger than the average bedroom and I have made it my sewing space for the past 9 years. 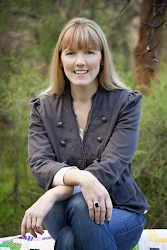 In that time I have gone from Quilting as my hobby to Quilting and Sewing as my Full-Time profession and passion. During 2017 I was designing, creating and writing my second book and the space just wasn't working for me anymore as I really had outgrown the space to be working and sewing in effectively most days. I was feeling cramped and cluttered but with the book tights deadline any chance of re-vamping was out of the question. During the Christmas break, with deadlines done and dusted, I decided that it was time to "make time" to reconfigure and work out a way for my space to be better, more functional and mostly be a place that I was happy to work in everyday. My hubby sat down and drew out a scale plan and came up with some new ideas that would work for the space with using the existing furniture that was working (or couldn't work without) and some new furniture that would provide what I needed. 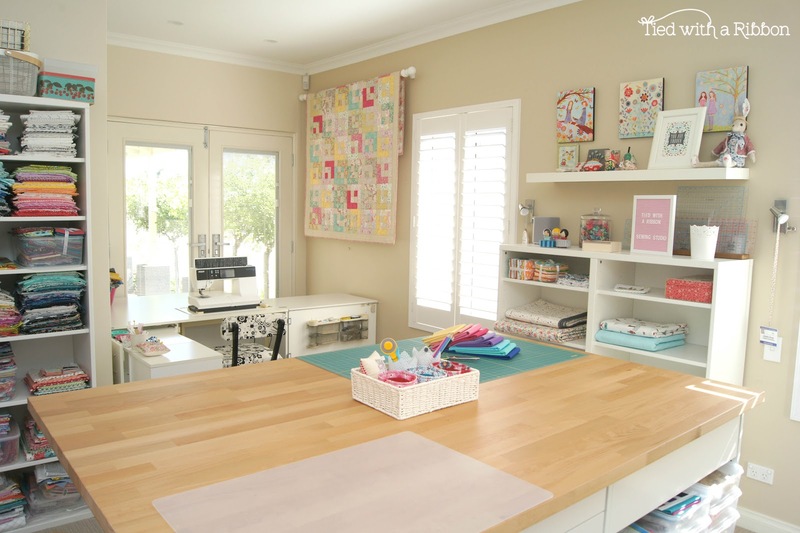 Welcome to my re-vamped sewing studio - I am going to show you all the pieces in my room and tell you all about what I have in my space and how I have created a better space to create in. My studio has these beautiful double Glass panelled doors which lead to the front porch where we have planted Iceberg Standard Roses. This makes for the perfect view to watch out and sew by. 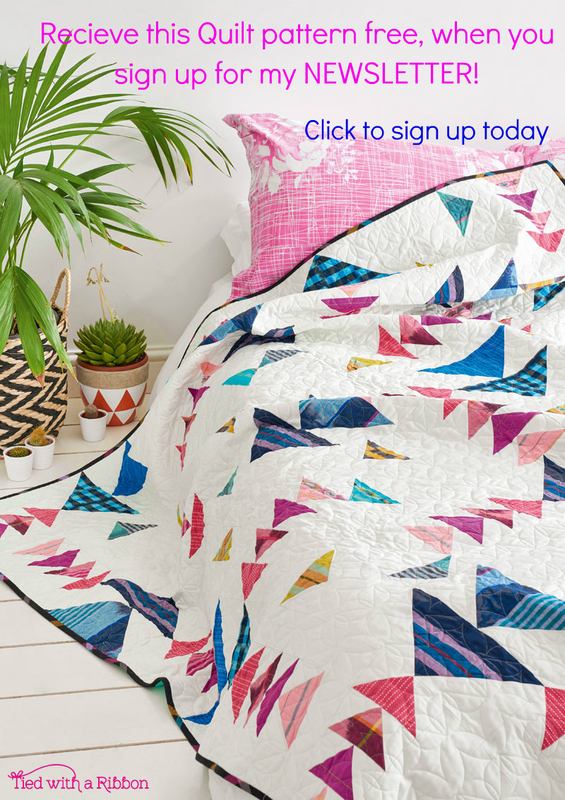 The Quilt waning is my Liberty Belle Quilt - it is one of my absolute favourite makes - It is made with a Japanese Cotton/Linen Blend and some of my favourite Liberty fabrics. It is all hand quilted and was one of the first Magazine Commissions I did. 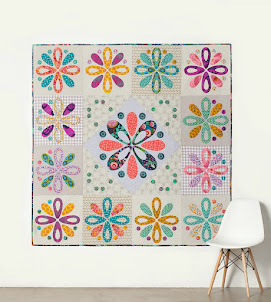 While I tried other quilts in this space to change it up a bit - my heart kept going back to wanting this one up. The Rails are Window Hanging Rails from Spotlight - these are perfect to hang quilts off - you can change the quilts around and fold lots to fit several along the rail. The sewing cabinet is a Horn - Sovereign Mk III. 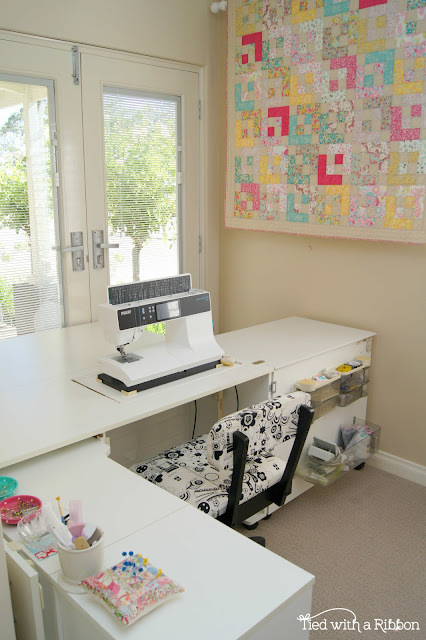 This allows me to lower my sewing machine to the bed height and then I can machine quilt with a flat surface and a nice big table space behind the quilts and projects. I have a few draws and my Overlocker is also stored in the side of the cabinet. My chair is also a Horn Chair - it's a gas lift and has great support for my back. 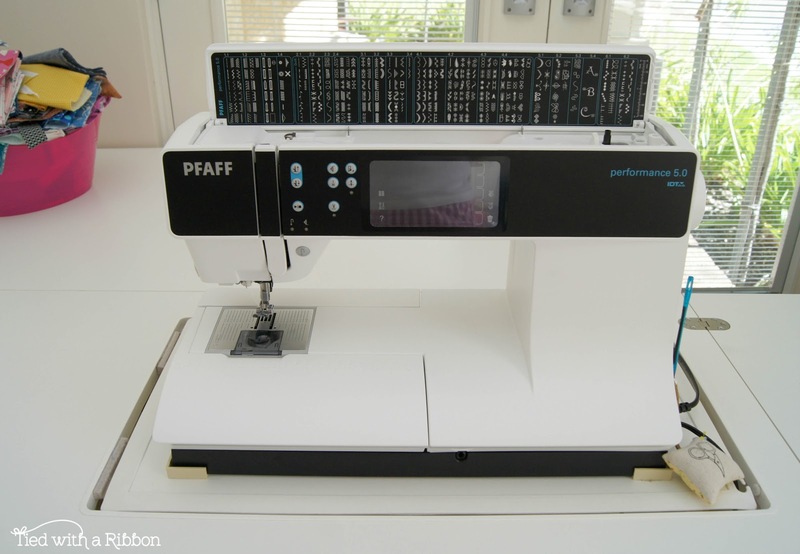 My main sewing machine is this amazing Pfaff Performance 5.0. I bought it several years ago and I couldn't love this machine more. 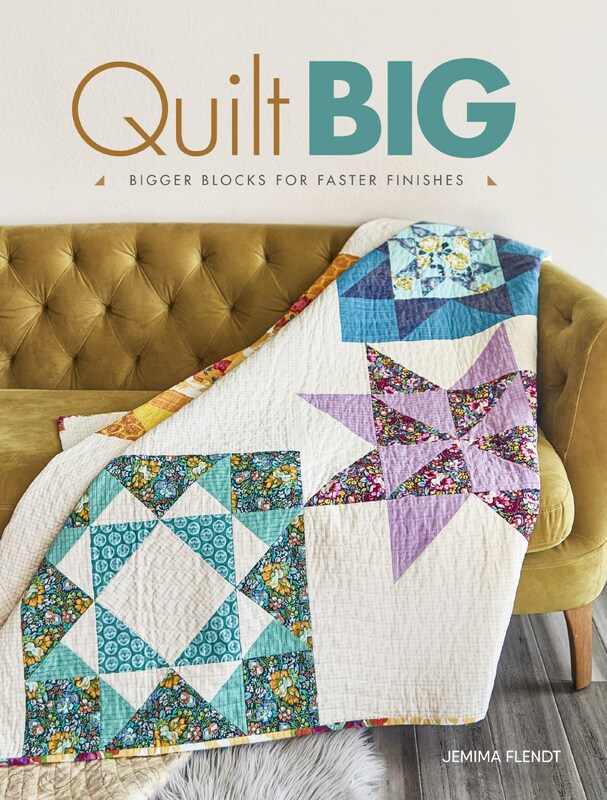 It works so well with my sewing and quilting needs and rarely gives me any grief. She really is a workhorse and has sewn countless Quilts, Pillows, bags and so many other things. This workbench is really the new highlight of my sewing studio. We took out the desk which I used to work at and have replaced it with an Island Bench. Hubby and I went to Ikea and custom built a Kitchen Island Bench to meet my needs and sewing requirements. The bench is really deep so I have gained so much storage in it. We configured a mix of draws and shelves so that some things I can have easily at hand and on display - and also have lots of my smaller pieces of equipment like cutting rulers, scissors, stationary etc neat and tidy in the draws so they don't spill out. 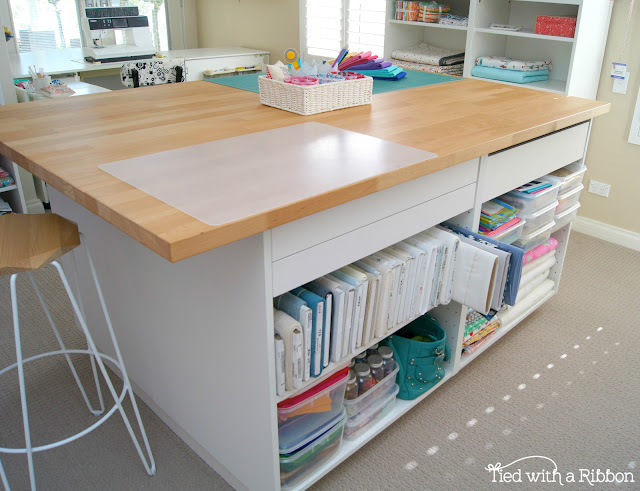 As I lost a working desk area - we pulled the Benchtop to one end creating a "overhang" so that I could get a stool under it to sit at - this is now where I will do my paper work etc and I have put my stationary draws close by for this purpose. I can now stand and cut at this bench (which is a great height and back-saver) comfortably. I used to cut out on my Laundry Bench bench and now have some space back in my laundry. My Dad was a big help during this make-over. We bought two Island Bench tops and Hubby and my Dad "Biscuit Joined" the two tops together to create the depth I needed and due to the woodblock of the bench top - its hard to tell the join at all. Thanks Dad for helping put this together and for the heavy lifting work while putting it all together. This shelving area is a favourite in my room. It is filled with special trinkets and gifts I have been given by some special "sewing" friends over the years. It really makes me feel like even though they are all so far away - they are always here in my creative space. 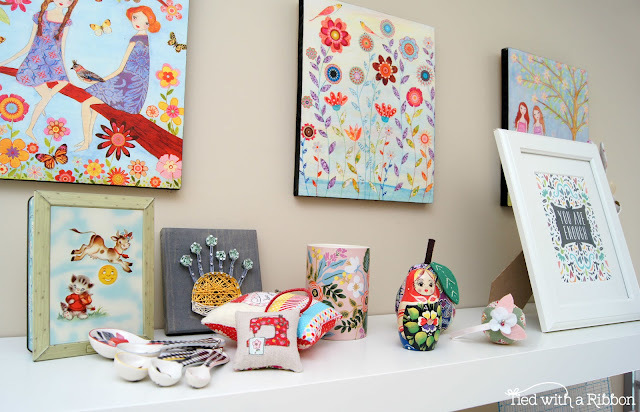 I love that I have so many handmade treasures. You can click on the link to some of the pieces I have specifically purchased for my sewing studio - Letter Board, Binding Babies by Shari at Doohikey Designs, "You are Enough" print by Pen and Paint, Art Paintings by Sascalia. The book case is a bit of a work in progress - It is great to house my rulers and Boom Box and to add trinkets too. I think as I settle into my sewing space the shelves will inevitably fill and I will make better use of them. The Shelving above is from Ikea (they don't make it anymore however - which we found out when I went to buy another book case this size). It is great as it is rather deep for shelving. I have had a clean up through my fabric stash and put collections together based on Designer and then I have other bundles such as Low Volumes, Solids, Linens and Denims, Colour and those plastic Decor Containers hold all my special Liberty fabric. It also houses my older Pfaff Tiptronic Sewing Machine and my Bernina Tula Pink machine. I definitely feel re-inspired in my sewing space and can't wait to get sewing into the new year and creating and designing new patterns in this space. 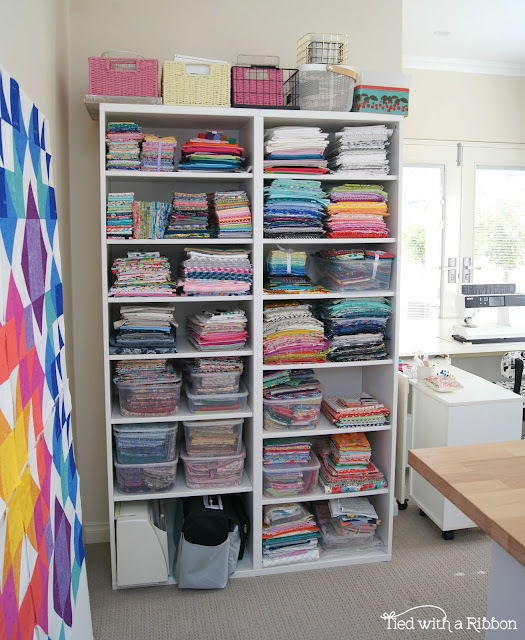 While I know not everyone has a dedicated sewing space - no matter where you sew or create, make the space work for you! So that the time you do get to sew - is truly enjoyable. Beautiful area, and I love how you arranged all the lovely new and old cabinets! So happy for you :)! It looks lovely and feels so cozy and cheery at the same time. I’m envious! Your room is so bright and happy! 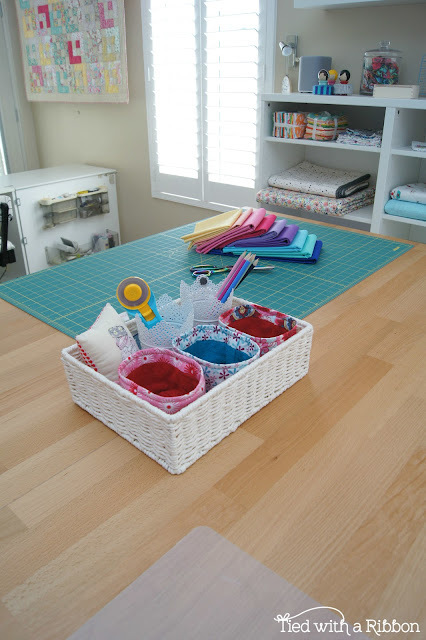 Your sewing space is lovely!! Bright, cheery, and happy. Have fun sewing in it. Beautiful space! Thank you for sharing! Very lovely~ i have a great spot for a sewing room and your space provides wonderful inspiration. Alas, I've been working in another state away from home for four years and have spent my sewing time at a 3'x 2.5' spot in my camper. It has worked and many quilts were made there, I am Looking forward to a cleaner and more open space when i get back home! Thanks for showing Jemma. I too got the "clean up sewing room" bug. So nice to have a room that works. Thanks Sue - very kind of you - I too cant wait to get sewing.